Sothys Restructuring Youth Cream is an exclusive BP3 Tri-complex anti-aging cream that helps to visibly smooth deep wrinkles by effectively fighting against slackened skin and sagging tissue. Containing Sothys exclusive BP3 Tri-complex™, it protects the skin, along with a pool of specific active ingredients that target the signs of chronological ageing. βP3. Sothys Restructuring Youth Cream fights against oxidative stress with Saffron and Sophora flower extracts and Peptides while visibly limiting the appearance of wrinkles and skin sagging. 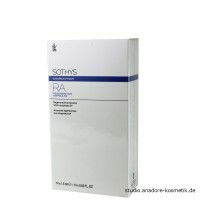 After cleansing, apply your routine lotion and Sothys Youth serum. Take a bean size amount of Youth Cream and gently massage onto face and neck, avoiding the eyelids. Suitable for daily use (morning and night for best results).